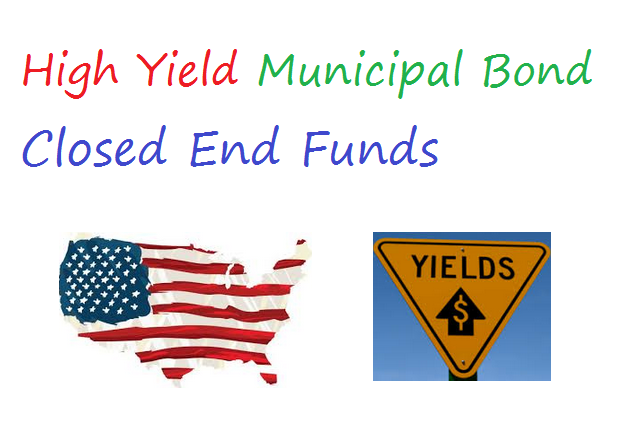 Find top 6 high yield municipal bond closed end funds 2015. These best muni bond funds are Nuveen Muni High Income Opportunity Fund, MFS High Yield Municipal Trust. High yield municipal bond funds invest mainly in low quality municipal debts. These bond funds may provide high yield income for you. The yield may be tax free from federal income tax and possibly state income tax. Whether you should invest in these top performing municipal bond closed end funds, you need to do details research. You can buy these CEF funds using your brokerage for your investment account, retirement account, etc. These investment funds are managed actively by the fund manager(s). Find the fund review below. The funds are sorted based on its performance in 2015 (up to August 7, 2015). This Nuveen Muni High Income Opportunity Fund provides high current income exempt from regular federal income tax. This fund has total net assets of $770 million. Its expense fee is 1.27%. The fund manager is John Miller since 2003. The current yield is 6.82%. This taxable equivalent yield is 10.49%. Morningstar has ranked this municipal bond fund with 5 stars rating. In 2015, this fund has year to date return is 3.63%. It has returned 5.85% over the past 3 years, and 7.91% over the past 5 years. This MFS High Yield Municipal Trust has a high yield of 6.91%. This fund’s market price is trading 13.13% discount to its NAV (Net Asset Value). The fund sponsor is MFS Investment Management. The expense fee is 1.99% per year. As one of the top 6 high yield municipal bond closed end funds, it has an annualized return of 6.64%. It has returned 4.46% over the past 5 year, and 4.22% over the past decade. The annual portfolio turnover rate is 28%. Top 3 state allocations are Texas, California, and Illinois.